First wonder of the day was the warmth of the strengthening sun. No need to wear layers today. 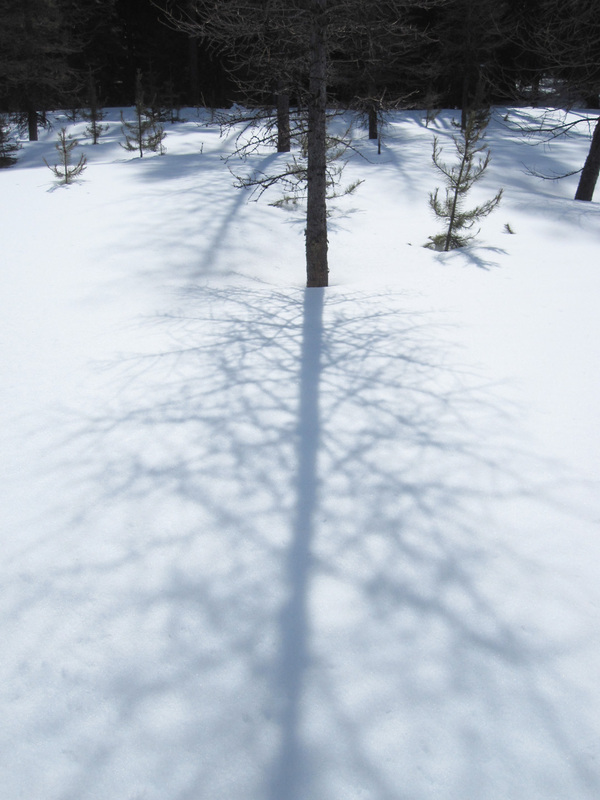 Snowshoeing up through the mushy spring snow, I noticed the shadows of the young larches. Maybe it’s the angle of the sun that makes the shadow nearest the bole of the tree sharp and in focus. As the shadow extends to the top of the tree, it got blurry. When I stood at this tip and looked at the tree, it occurred to me that it was backwards. One of the principles of atmospheric perspective (first described by Leonardo Da Vinci in the 1500s) is that things closest to us are clearly defined and detailed. As distance increases, focus decreases. This is generally true, but also an illusion. Vision doesn’t always work this way, and I found it kind of fun to have my assumptions turned upside down. 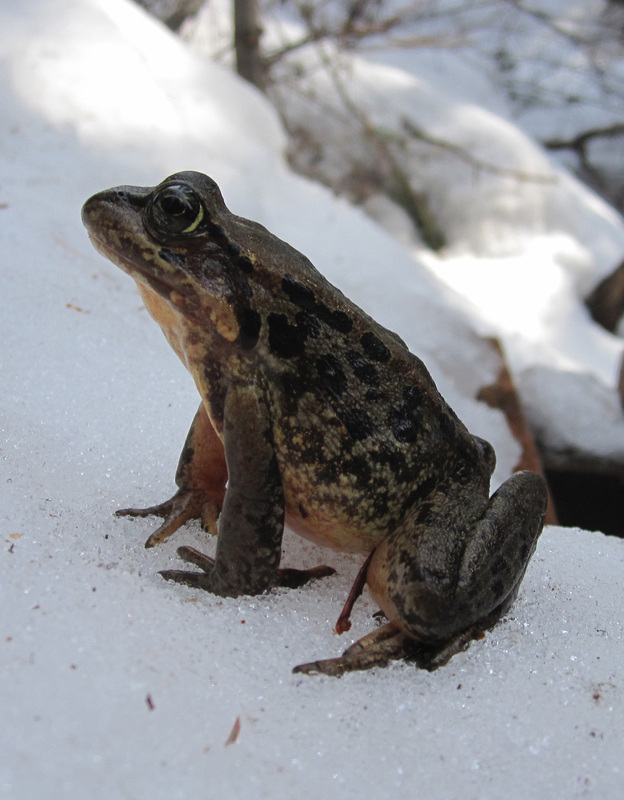 Second wonder was coming upon a Cascades frog sitting on the snow. We were heading back to the truck, and I saw Jon come to a halt in front of me. He had just crossed the creek on a small bridge, and took out his camera. As I got closer, I could see the creature right in the middle of the trail. Jon had almost stepped on it. I got down right next to it, scrabbling my snowshoes on the snowy creek bank. The frog’s throat swelled and relaxed, swelled and relaxed. I wondered how cold it was. Surely amphibians must have antifreeze in their blood. We wished the frog well and continued on our way. Debra, I LOVE frogs, lol. You got to see your Washington frog yesterday… and I got to hear the first croakings of our Maineiac frogs today… don’t know what type they are; I’m not diligent that way. I should find out! They’re in wet areas of the woods. P.S. Without actually going to look; which I now intend to do; I must be hearing the Northern Race of “Green Frog” or the chorusing of “Leopards”… Leopard frogs, that is! The big ol Bullfrogs will be “jug-0-rum-ing soon now, too. Love it! Spring must truly be coming if the frogs and other critters are coming out of their winter hideouts. Quite warm here for a while today, then the clouds and wind came up and a jacket felt good. No frogs here in the desert yet, but we do get one once in a while.